Yes, I did start this post out with a Legally Blonde quote. Hail to the great Elle Woods, every young, blonde aspiring lawyer's unrealistic role model in hot pink. But in reality, very few aspiring lawyers decide to go to Law School in Elle Woods fashion and follow their ex-boyfriend to Harvard after scoring a 170 on the LSAT and getting a 4.0 GPA in Fashion. Most of us have been planning this for years; maybe even since we were kids. I personally have wanted to be a lawyer since I was a very little girl. I love to argue, I love to read and write and I am fascinated by all things legal. It was a natural progression to finish high school and head off to work on a Pre-Law degree for undergraduate college. It was then that I truly realized what it takes to get into Law School and become a Lawyer and boy was it a shocker. It most certainly was not as easy as Elle made it seem. I am graduating this spring, getting married this summer and I will start Law School in the fall. I have been accepted to every school I applied to thus far with a scholarship and even received two full-ride scholarships. 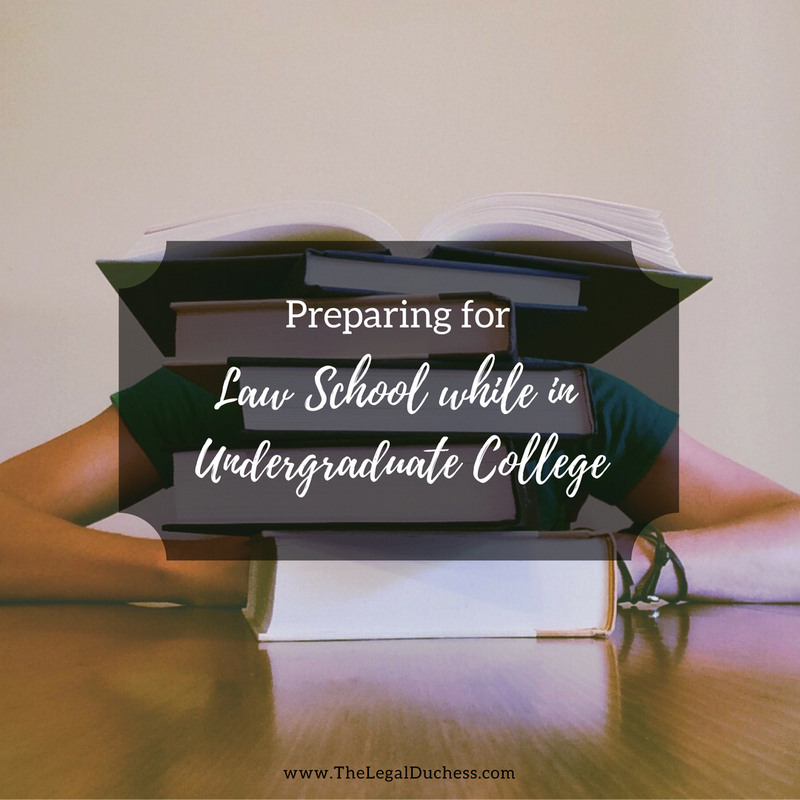 So with no further ado, here is what tips I have for preparing yourself to get into Law School throughout your undergraduate years. My first day of Intro to Law, our professor stressed the importance of two things for all of us starry-eyed, aspiring lawyers: GPA and LSAT score. These two 3 digit numbers can quite literally make or break your entrance to law school and scholarship possibilities. If I get anything else across through this post I hope you get this: keep the GPA as high as you can. It honestly is not that hard. Do your homework, study for your tests and show up to your classes. No C's get degrees if you plan on going to law school; Shoot for a 4.00. As for the LSAT, we will address that torture tactic further down the post. A high GPA can give you some grace on a not so hot LSAT score and you can control your GPA way easier than your LSAT. Just like college applications, Law Schools like to see people who are involved and engaged and well diversified. Join a club, do an intermural, volunteer; whatever floats your boat just get involved. The more diverse and engaged you seem, the better. Also, leadership positions are fantastic bonus points. Find out if you University has a Pre-Law club where you can get involved and learn more about the Law in the process. This will also help you define and improve those time management skills.... I hear those are integral to law school. I was President of Law Society, rode on two equestrian teams, volunteered and was a student ambassador for my college through my 4 years. Sitting down to decide which law school you want to apply to and later attend can be daunting. The more campuses you visit and learn about, the better you will know what you like or dislike in a Law School. Also, each visit will provide you will more tips and tricks about the application process and subsequential law school experience. Admissions are great to talk to and any advice they have is gold; after all, they accept or deny you. I did about 12 law schools visits prior to my application time and I felt so prepared and confident in my decisions and what I wanted in a Law School program. Get to know them beyond the pleasantries and classtime. If you make an effort, they will want to help you out so much more. They are here to teach you but they are such great resources beyond that. My advisor took me on multiple law school visits, set me up with an internship when I was a sophomore, helped me through the application process, edited my personal statement and from day one of college was helping me to prep myself as successfully as possible to be what he called "a hot commodity" (a student law schools wanted to accept and be a part of their school and handed out full rides to like candy) to the law schools. Without my advisor and professors, I would not have been so successful or known what to do to get into law school on a full ride. Also, the better they know you, the better their letter of reference is and those are another integral part of the application process. Challenge yourself and figure out your study style now. It will help the transition to the intensity of law school later (or so everyone tells me). Also, writing classes are supposed to be a huge helper. The dreaded Law School Admissions Test.... a form of self-inflicted torture that we pay obnoxious amounts of money to participate in and feel half dead afterwards. It is not fun at all but it is part of the deal. My best advice is to start studying earlier than you think you need to. The earlier the better. Also, study in small increments; if you try to do an extended cram session of this material, it may kill you. It is dense material that is bets learned in little doses and practiced extensively to become comfortable. It is hard and not the least bit enjoyable but once it is over, you never have to think about it again and that is the best salve I can offer regarding the months of studying and brutal 5-hour test. I found most helpful to do full, timed practice tests once a week for about 10 weeks beforehand. I felt confident, I had the endurance for the test and I was comfortable with the time limits. Beyond that, it is not forever and there is a light at the end of the tunnel when the torture will end. A good LSAT score is integral to getting into Law School with a scholarship so take it seriously, buckle down and get that score. There you have it, my most basic tips for preparing yourself for law school during undergraduate. You have to spend your 4 years with your eye on the prize; getting to your senior spring semester and then starting all these things just won't cut it and you won't be getting full rides to Law School, you'll be praying to get in at all. Don't get me wrong, have fun and enjoy college but keep one eye on the future and take the necessary steps to ensure that future is as bright as it can be. I loved my 4 years of college and I am so blessed to have my 4 years of hard work result in my multiple acceptances and full ride scholarships to Law School. I wish you all the luck in this challenging endeavor. As Elle says, "It is with passion, courage of conviction, and strong sense of self that we take our next steps into the world, remembering that first impressions are not always correct. You must always have faith in people. And most importantly, you must always have faith in yourself."